Beats By Dre products are banned by the NFL. Beats by Dr. Dre, a company formally established in 2008 by Beats Electronics comprised of a family of premium consumer headphones, earphones, and speakers as well as patented Beats Audio software technology and streaming music subscription service Beats Music. The products have become a favorite of pro-athletes, music tastemakers, and consumers around the world. Beats is primarily known because of co-founder and rapper-turned-businessman Dr. Dre and co-founder music producer Jimmy Iovine. Mega media giant Apple announced in May 2014 it had acquired Beats Electronic for $3 billion, including $2.6 billion cash up front and approximately $400 million in stock that will vest over time. As part of the deal, “Beats” co-founders Dr. Dre and Jimmy Iovine joined Apple AAPL -0.32% in undisclosed roles. On Thursday (Oct. 9th), 49ers quarterback Colin Kaepernick, who is a paid endorser of Beats, wore his Beats by Dre headphones during a postgame press conference, and the league punished him with a $10,000 fine. Though Kaepernick is the only one officially hit with a fine so far, plenty of players continue to wear their Beats headphones on the field. As for why the players continue, there’s a really good reason. Their endorsement deals are bigger than $10,000 and the publicity is worth more than that to Beats. 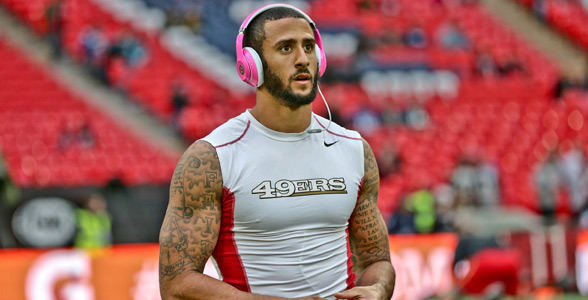 Kaepernick was coy when he was asked whether he’d be reimbursed by the company, which dominates the headphone market. “We’ll just let that be unanswered,” he said. Instances of civil disobedience are rare among NFL players and it will be interesting to see if players stick with their Beats products.